This famous mission celebrated its 60th anniversary on 18 February and Paul Sortehaug writes of New Zealand's involvement. On the auspicious occasion of DAK's anniversary, Rob Neil talks with the people who keep this aircraft flying and ensure that the ""Dak"" remains an unending source of interest. 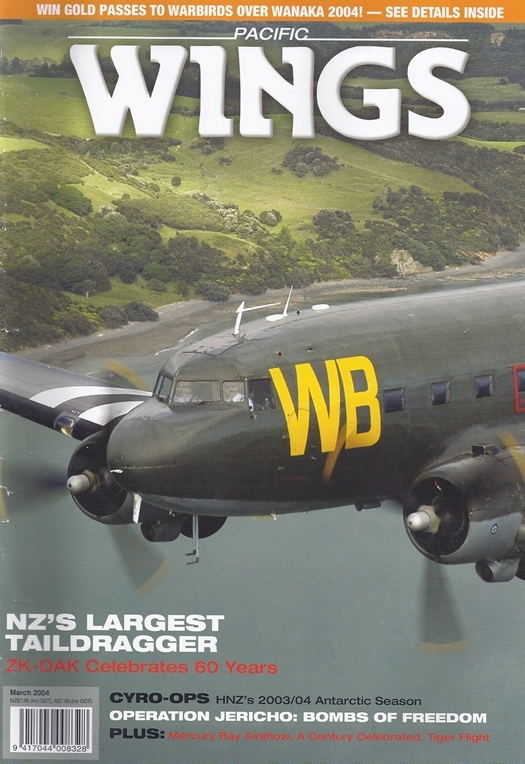 Loved as much now as it was 50 years ago (if not more), the Tiger remains prevalent in New Zealand skies and a flight in the type can be an experience of a lifetime, as Geoff Best found out recently. 17 December 2003 - the 100th anniversary of powered flight - a special date for all aviators and one which English pilot Peter Hirst and his son Steve celebrated in vintage English style at Old Mandeville Airfield. Far from its comfortable Nelson nest, Helicopters (NZ) has stretched its rotary wings around much of the globe, from Cambodia, Burma and Laos to Western Australia and Antarctica. Peter Clark takes a brief look at the company's successful Antarctic operations during the 2004/04 southern summer season.